February 28, 2017 By Claire Davidson & filed under Blog, Recipe Roundups. 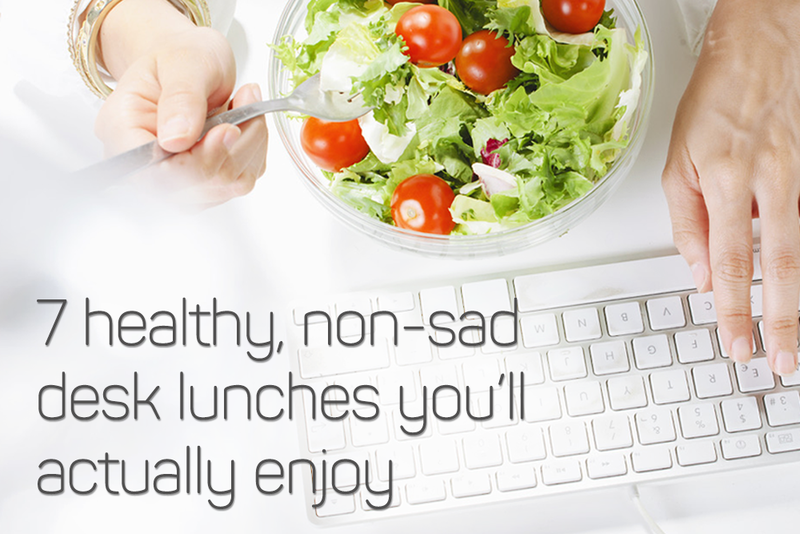 We’ve all had a sad desk lunch before: you want to save money and eat healthy, so you pack a meager salad or a sandwich that gets soggy waiting in the fridge all day. And when you finally end up eating it later at your desk, what you’ve packed for lunch makes the whole scene seem a little…depressing. Have no fear! We’re here to bust you out of your sad-desk lunch rut. An easy, portable lunch can still be healthy and delicious. Just try any one of the seven healthy lunch options below! Bonus points if you can escape your desk and eat your meal elsewhere for a few minutes—your email will still be there when you get back, promise. The peppers in this fresh, simple pasta really make it pop; it’s full of flavor yet still light enough that it won’t weigh you down for the rest of the afternoon. Prep this pasta in just a few simple steps at home and reheat at the office; but careful, the wafts of this truly delicious dish might inspire some cube-mate jealousy! Prep a big batch of this lightened up version of chicken salad ahead of time and use it in sandwiches, wraps, or on top of salad greens. 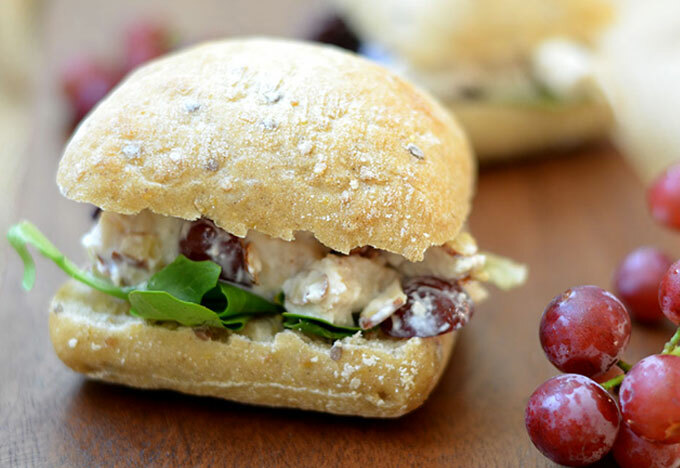 The high-protein Greek yogurt in this recipe makes it healthier than normal chicken salad, which is usually made with mayo. It’s a yummy, satisfying choice that tastes as good as comfort food without all the calories. 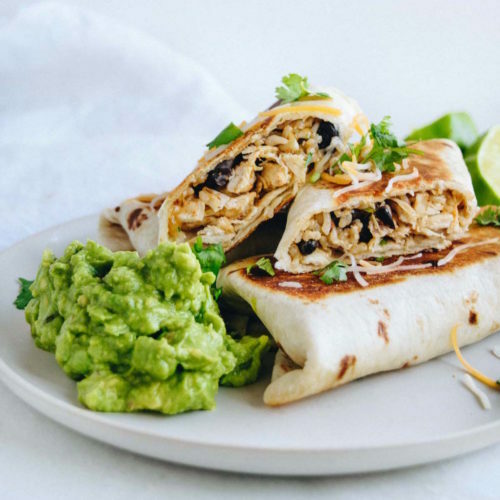 This yummy burrito is the definition of quick and easy—and at just over 300 calories with 13 grams of protein, it’s a healthy lunch that will actually fill you up. The avocado lime spread is delicious, but you could also serve with a little salsa or greek yogurt on the side as a healthy sour cream substitute. These bean and rice burritos also make a great freezer meal because you can make them ahead of time, wrap them up individually in the freezer, and then take out as needed! 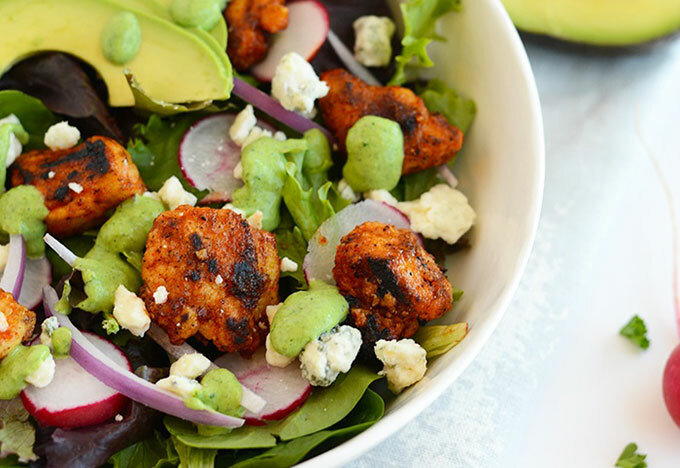 Say goodbye to sad desk salads—this zesty Sriracha chicken salad is bursting with flavor and has enough protein to actually fill you up! The blue cheese crumbles and Green Goddess dressing make it a decadent dish full of texture, flavor, and spice! It’s ridiculously easy to throw together, and you’ll be counting down the hours until lunch as soon as you get to work. 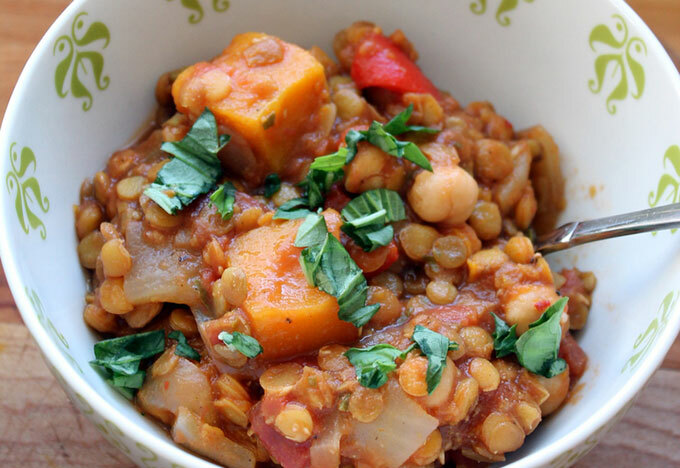 If you’ve ever felt like your lunch lacked flavor and was pretty much just “meh” then meet the answer to your problems: this delectable Moroccan stew made with sweet butternut squash, protein-packed chickpeas and lentils, and tons of flavorful spices. There’s nothing better than a hot lunch, and this warming stew will revive you from your mid-day slump. You’ll get a hearty dose of vitamin A, fiber, and tummy-filling protein from the ingredients. If you’ve never made a mason jar salad before, they’re incredibly easy and portable (oh, and also super cute.) This version is full of yummy veggies, cooked quinoa, beans, avocados and more—ensuring you stay full and satisfied all afternoon. 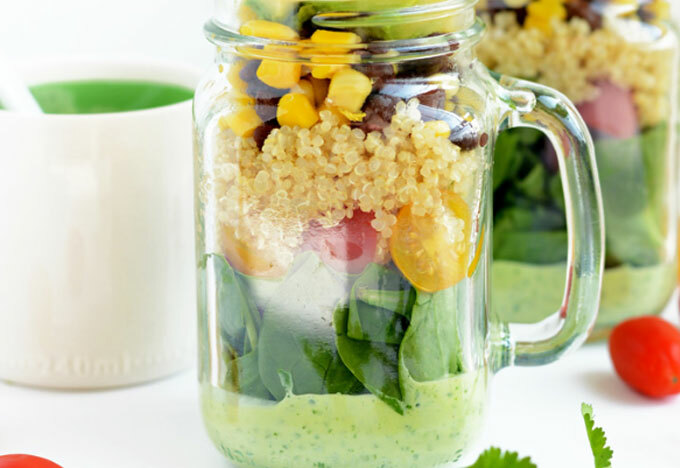 The best thing about packing your salad in a mason jar is that the dressing stays at the bottom to preserve freshness and then when it’s lunch time, you just shake the jar in order to stir the dressing! There’s nothing worse than a soggy salad, and this simple hack prevents that all-too-common lunch blunder. 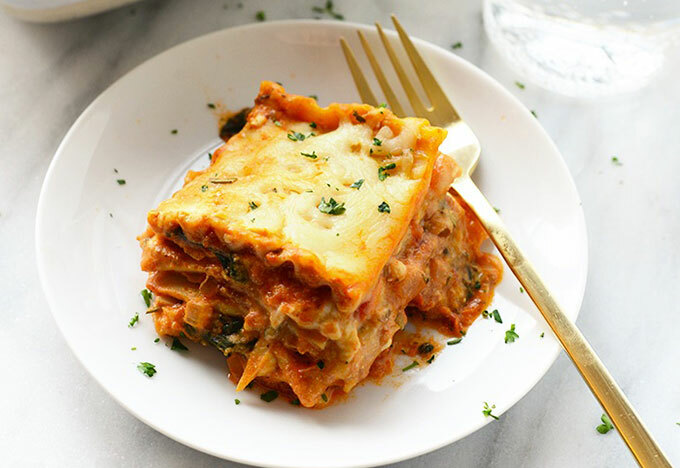 Get creative with your comfort food with this delicious sweet potato lasagna! It’s made with lower-fat cheeses like ricotta and cottage cheese, plus four different kinds of veggies. 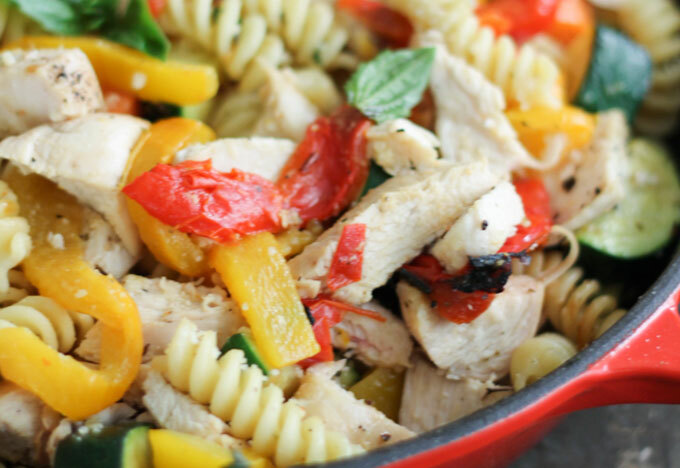 Consider it the new way to get your pasta fix while still eating healthy! Bonus: lasagna usually reheats like a dream, so it’ll still taste as fresh, hot, and delicious as when you prepped it. What’s your go-to healthy lunch? Let us know in the comments!